It’s a process so intense it requires a War Room. One day in the national spotlight wasn’t enough, so it got two. Coaching staffs and media outlets alike appoint full time jobs to the cause. College football recruiting has taken on a life of its own in recent decades and evolved in ways we’d once never imagined. For the Florida Gators, that evolution has brought about a wave that at its core is the simplest principal; let the players recruit. And as the 2019 class put on it’s finishing touches this Wednesday, they saw the fruits of their labor pay off. Diwun Black calls himself the eagle in the sky. 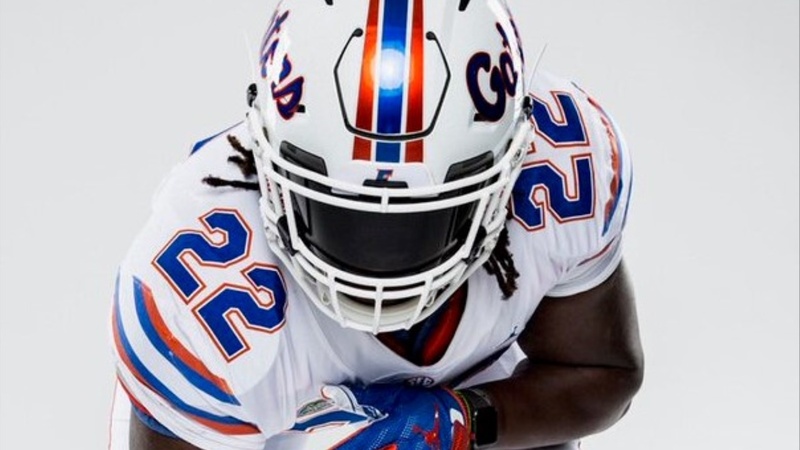 If Black—who officially signed with the Gators on Wednesday as a 2019 linebacker—saw a new prospect for head coach Dan Mullen’s squad pop up on his radar, he’d gather five quick facts about them then distribute. If it was a corner, he sent them to fellow 2019 commit, Jaydon Hill. A wide receiver might be sent to Dionte Marks. Since Black first committed to the Gators back in August, he’s been on one mission; to put together one of the Gators best classes in years. It started with Hill. Jaydon Hill worked out as a positive for the Gators, but Mullen explains that having these student recruiters out face to face with other atheltes can help the coaches narrow their target list in more ways than one. For Mullen, having all of the guys—especially Black—out in the field recruiting was huge. The 2019 class also stood out by staying together, something that can’t be said a lot in today’s high stakes world of 100% commits who are still open to other schools. They have a group text and each new commit would be added as they came. If someone began to waver on their commitment, he’d alert the group and his classmates would have time to talk to him about it before anything was made public. It’s not uncommon for players to reach out to other prospects and talk up their schools, but this 2019 Florida class took up the cause with a zeal that is, well, uncommon. “I knew that I was gonna sign with Florida and go to Florida so I talked up Florida, I wanted the best to come with me too,” explains Black. The biggest pay off from this practice though won’t be seen for another year. Black says the 2019 class has made it a point to reach out to those in the 2020 class, encouraging them, checking in and answering any questions. Now those juniors have taken up the banner as well, taking it to new levels that rival the coaches who recruited them in the first place. The 2020 class decided if they were going to do this recruiting thing, they were going to do it right; so they got out a map. Each player gets an area that’s “his” so to speak. Defensive tackle Gervon Dexter‍ is responsible for Polk County. Defensive end Josh Griffis‍ is responsible for those in his IMG area. So on and so forth. If there are two players in the same area, they’ve worked out a diplomatic solution. Jaquavion Fraziars‍, a Dunnellon native who had to give up the Gainesville-Ocala area to Leonard Manuel‍, explains. And don’t move in on someone else’s guy. Dexter once began talking to a prospect who was considered Fraziars' territory. “I hit up the quarterback and he didn’t really like it,” laughs Dexter. Dexter later returned the sentiment when Fraziars moved in on Dexter’s guy. Fraziars, to his credit, has more responsibility with which to keep up on a daily basis. As the self-proclaimed best recruiter in the class, his classmates “rewarded” him justly with the whole nation. How’s a junior from Dunnellon supposed to handle an entire country worth of recruits? “I don’t know,” he says with an exaggerated sigh. “I think I’m doing pretty good. I done made it to about as far as Texas; I think that’s alright…I went to Texas in January for the National Combine. And just like the class before them, the 2020 guys have realized their practice can help the coaches they’re committing to as well. “It’s just building a better relationship with the coaches also,” explains Dexter. Like the 2019 class, this class has a group text and Fraziars says everyone works to hold each other accountable. If someone begins to doubt or waver, they jump in and weigh the factors with them. Fraziars feels it’s his duty, like Black, to point out guys as well. Dexter is still working on his main guys and has experienced recent success with quarterback Carson Beck‍ decommitting from Alabama. “I just tell him, I always tell him since he’s a [former] Alabama commit, I always tell him you see what happened to [Jalen] Hurts. I just tell him he don’t wanna really put himself in that type of situation and I told him that never happened at Florida and even with this year with [Feleipe] Franks, I just kept telling him that and continue to tell him that. Dexter isn’t the only one who feels this should be a priority. Dan Mullen sees the mindset already developing in his recruits. As the 2019 class begins to shift from recruits/commits to current Florida student-athletes, the 2020 class (currently ranked 6th in the nation) will move into the spotlight that shines uniquely on college football recruiting. The coaches will get to work putting together a Top 10 finish and in a trend that has flourished out of Gainesville, they’ll be getting a lot of help from their boots on the ground; a class made up with as many recruiters as recruits. This is a fun look at how our guys recruit. You have to give them credit for being so dedicated. Thanks guys, I'm glad y'all enjoyed it! It was really cool to talk to them and hear how much they feel responsible for these classes. Someone made a great point in relation to this topic on Twitter that I wanted to share...if Mullen trusts his commits enough to listen to their opinion on other recruits, imagine how much trust he'll put in one of his captains. In other words, CGJ's opinion of Fuller might be why they didn't push too hard for him.